The knee joint, medically known as the tibiofemoral joint, is the largest joint in the body. Two bones make up this joint; the femur and tibia. There is also a sesamoid bone, called your patella or kneecap, that resides above your knee joint. The function of your patella is to improve the way your quadriceps muscles work, providing a mechanical advantage for them as they extend your knee. The knee joint is dependent on the muscles to move it and ligaments which surround it for strength and stability. A ligament is a structure in your body that connects two bones together. Four ligaments are present in the knee joint: the medial collateral ligament, lateral collateral ligament, anterior cruciate ligament, and posterior cruciate ligament. These ligaments provide strength and stability to the knee joint, keeping the bones in alignment as your muscles move the joint. 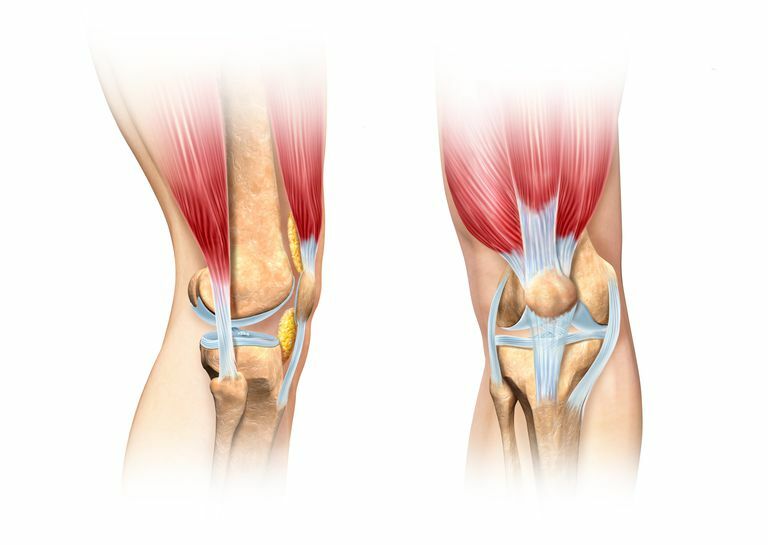 The medial collateral ligament (MCL) is located on the inside of the knee joint. It extends from the medial femoral epicondyle to the tibia. This ligament prevents the excessive abduction of the knee. It is a thick ligament that typically does not require surgery to repair if it becomes injured. The lateral collateral ligament (LCL) is located on the outside of the knee joint. It extends from the lateral femoral epicondyle to the head of the fibula. This ligament prevents excessive adduction of the knee. The anterior cruciate ligament (ACL) extends posterolaterally from the tibia and inserts on the lateral femoral condyle. This ligament prevents excessive anterior movement of the tibia under the femur. It keeps your shin bone from sliding too far forward during running, hopping, and cutting activities. The posterior cruciate ligament (PCL) extends anteromedially from the tibia posterior to the medial femoral condyle. This ligament prevents excessive anterior movement of the femur on the tibia. If you suspect you have sprained a knee ligament, you must check in with your doctor right away to get a confirmed and accurate diagnosis and to get started on treatment right away. Physical therapy is a good idea if you have sprained one of your knee ligaments. Your PT can work with you to restore normal strength and range of motion (ROM) to your knee and to help you return to maximal mobility and function. The goals of PT are to help your knee move better and feel better so you can return to your normal activity. Your knee is a major weight-bearing joint in the body and is responsible for walking, running, and rising from sitting. Injury to your knee can limit your ability to do these things. If you injure one or more of your knee's ligaments, you may benefit from physical therapy to help you regain normal mobility and function. That way you can quickly and safely get back to your normal activities. What Are the Symptoms of an MCL Tear in the Knee?